Fospice: Foster homes or sanctuaries which provide end-of-life comfort and care to terminally ill or elderly shelter animals until they're ready to pass on to the Rainbow Bridge. Donate to help our fospice dogs! Buddy has cancer. Sherry and Bob came all the way from Antelope (between Sacramento and Roseville) to bring him home. We are very grateful to them for responding to our Facebook post about dear Buddy. He’s now in a perfect fospice home. Sherry and Bob are experienced dog people, have been active in Boxer Rescue for many years and Bob is retired. They currently have 2 Boxers (former breeders) and a senior Pug. Also, it turns out that their vet is someone Alice has worked with before. Now Buddy will receive excellent vet care locally. UPDATE: Sadly, sweet Buddy peacefully passed on March 31st. We can't thank his foster parents enough for the love they gave this pup the last six weeks of his life. It takes a special type of person to be a hospice parent. We are so blessed to have Sherry and Bob as part of our Team Lily. 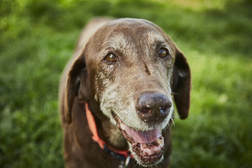 Andy is a 12-year-old Chocolate Lab who was picked up as a stray from a Yuba City shelter. He's a sweetheart and has settled in well at our sanctuary. The great thing about Andy is that he doesn't seem to know he's a senior at the end of his days. He is a dog on the move. There's still a spring in his step as he strolls around the Lily's dog park taking in all the smells or slowly but with purpose trotting after a ball. During barn time, he likes to explore every nook and cranny or hang out with his buddy, Henry (available for adoption). Ahh, and napping in the sun, well there's nothing like it especially after his daily explorations. Andy is a curious, endearing, lovable Lab with a love of life. We all love that dog more than we can say. He never fails to make us smile. Coco is an Aussie/Cattle Dog mix who is about 8 or 9 years old. This cute, cute little girl came to Lily’s when her human mom had to move into an extended care facility. She is a really lovable girl who just wants to be as close as possible to people and get lots of TLC. Sadly, Coco has some health concerns which makes her a fospice dog but she doesn’t act like there is ANYTHING wrong with her. ​Coco is a lively, loving pup. ​Dogs like Coco teach us so much about living each day to the fullest!